It had been over a year since we last donned the drysuits and waddled into the water. It’s totally awesome to be shore diving in the front yard, but the bods are not getting any younger, and contorting into the cold water gear and heavy weight harnesses, shuffling down a bumpy beach, wallowing around in shallow water to get the fins on, and finally swimming out to drop down are really not for the weak of heart. And once submerged, it truly is no walk in the park to dive in cold water. Low visibility (like today’s), chilly thermoclines, cumbersome dry suits, and tricky navigation over a silty bottom can all create their own challenges. But man, once all the fubars are resolved, it really can be a thing of beauty. Today, after a couple of false starts, including when one of my wrist seals pretty much disintegrated as I was donning my drysuit (thanks to DUI for zip seals that are easily swapped out, and to Mr G for getting ‘er done! ), we managed a 65 minute dive, to a max depth of about 60 feet. Dropping down into the murky shallows, right away we started spotting some cool stuff – including three Red Flabellina nudibranchs, one of which is featured above. Also sighted nearby (but not photographed because their rhinosphores – those horn thingies on nudibranchs’ heads – were inconveniently pointing into the reef) were a yellow margin dorid, and a sea lemon dorid. Suhweeeeeeet! 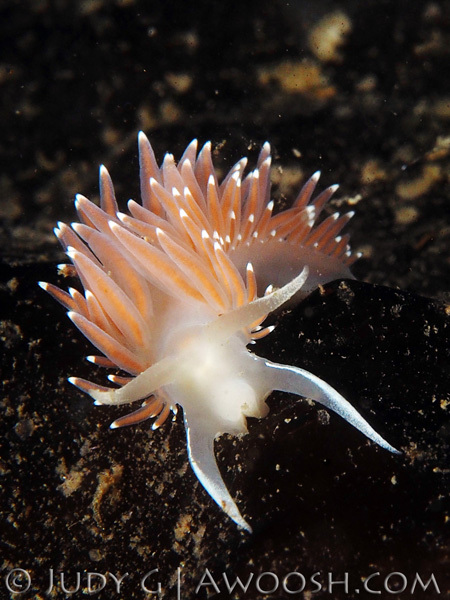 The nice thing about these cold water nudibranchs (all of which are quite common in BC) is that they are not tiny like many of their tropical cousins, and so are easier to spot, and photograph. The nudi above was about an inch and a half in length. Descending deeper, the visibility improved, but the water temperature dropped n-n-n-noticeably. The chill was rewarded by this pair of mating Dungeness Crabs. The male, which is the larger of the two, was not so pleased with the paparazzi, and forthwith scuttled off into the gloom, all the while continuing to cradle the female under his carapace. 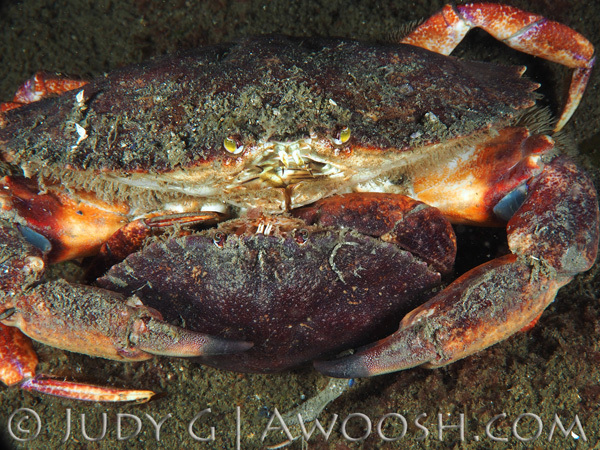 There were actually quite a few Dungeness crabs spotted, from juvenile to quite large. And then there was this. I’ll confess that I did not see the two very small shrimps in front of this feather star until I unloaded the photo from my camera. 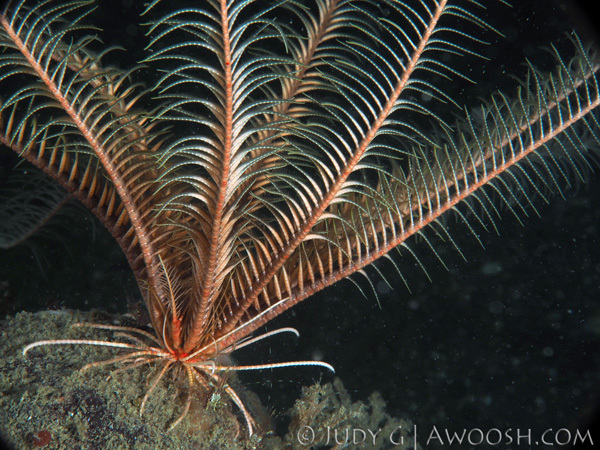 These feather stars are crinoids, like the ones we see in the tropical Pacific. They are weird critters that look like plants, but are actually animals, and they can swim by using their frond-like arms to lift them and move them through the water column. Bizarro. I have a bit of a thing about jellies. It’s not fear (although maybe it should be, as some varieties are highly venomous); it is awe. I find their movements very poetic and otherworldly. This jelly was about a foot and a half in height, and when I spotted it, it was just hanging quietly in the water column like some kind of alien entity. 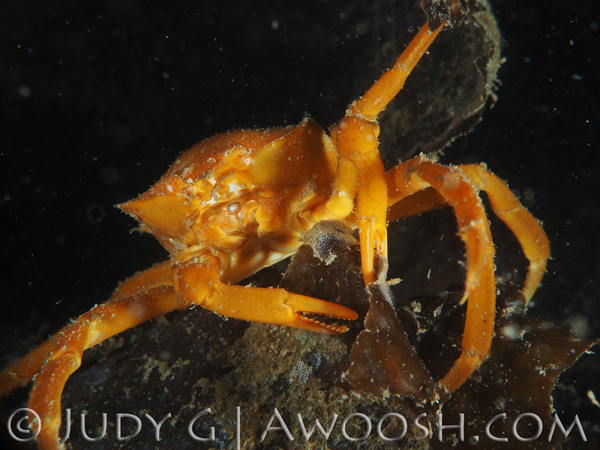 The last shot of the dive – a kelp crab. These guys are about 6 inches across. This was only the second time I have seen one of these crabs – the other was up in Discovery Passage quite a few years ago. So all in all, a pretty skookum dive today. It felt good to be back diving (cold) water again. My job is to stay fit enough to keep doing this kind of strenuous local shore diving – there is a lot of underwater real estate still to explore, including some deeper areas on rocky outcrops, and a black diamond muck slope that goes down to at least 100 feet. 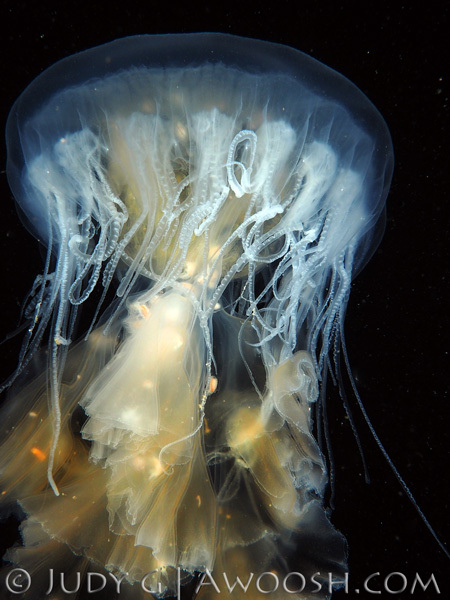 This entry was posted in All About Scuba Diving, British Columbia Travel, Image Galleries, Photography. Bookmark the permalink.